I call MAYA an opera because it was born from the spirit of opera. Escaping into a parallel art world, the overpowering strategies in the music, the longing for redemption: in this I see parallels to the techno movement of the early 1990’s. 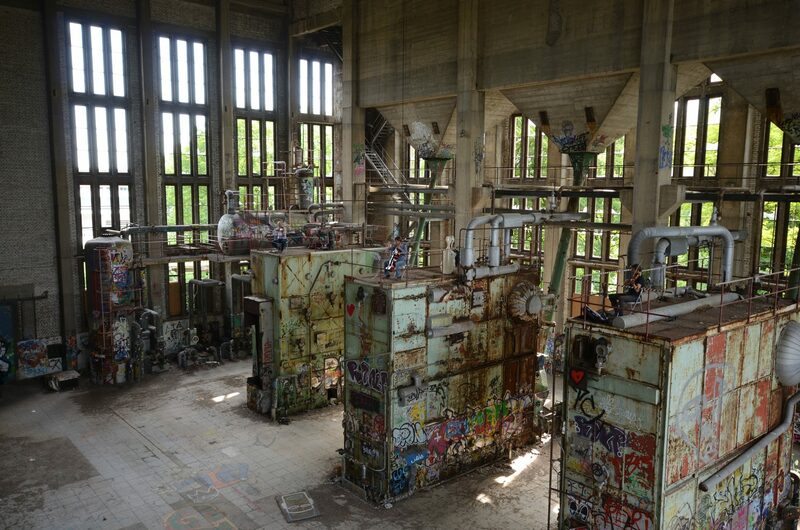 In the ruins of the combined heat and power plant Munich-Aubing some of the first raves took place, long before commercialisation destroyed the original spirit of Tekkno. I am very happy to have won him over for the MAYA project. His music and approach form the core of the evening. In addition to Klavikon, sounds and loops are played by the Los Angeles-based synth programmer and film composer Jörg Hüttner and sound and music designer Björn Eichelbaum. The collaboration with all four of them is done in such a way that they either create sounds suitable for a track I have composed, or I sample and remix their talents and form the music from them. During the piece, she is repeatedly called by a choir of creatures from the digital world, recorded by the 16- and 17-year-old singers Michelle Friedrich and Miriam Hampe. Voices from the intermediate realm between childhood and adulthood. On top of the ovens (as seen in the photo above) the musicians of the string trio TrioCoriolis sit. They not only accompany the singer like an orchestra, but also play three solos as interludes. In addition to Domenico Gabrielli’s “Ricercare No. 7” for cello solo (Hanno Simons), you will hear the original composition of the violist KP Werani “Room 3”.